Abstract: An exhibition of drawing, murals, interactive installations and artists’ books held in the GAM de Gallarate in Lombardy (Italy) in March and April 2007. The Interattività Furiosa exhibtion, which was inaugurated on 8 March 2007 in Gallarate, opened a new door on Marcel·lí’s artistic work by showing for the first time one of the least-known facets of his work, his drawings. From the outset, Marcel·lí has used drawing as the essential material of his work, as a field of conceptual reflection and as the hypothetical evolution of his performances and installations; drawings are also the root-images of some of his animations. Given the importance of interaction in his work, these drawings could be considered pre-interactive material and at the same time they provide an effective means to understand his methodology, namely Sistematurgia. 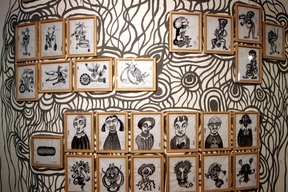 The almost 300 drawings included in this exhibition were mounted on top of murals drawn on the gallery walls. The exhibition at Gallarate also included the installations Tàntal, Rèquiem and Alfabeto, a selection of the Artcagarro artist’s books and the video catalogue of his mechatronic performances up to 2004. 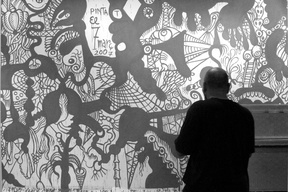 GAM produced the DMD Europa, Dynamic Mural Drawin installation. Dynamic Mural is an interactive installation that shows a mural that was painted over a period of a week in three films of only a few minutes each. Thanks to sensor mats on the floor, the spectator can choose one of the films and also the perspective and speed of the projection.